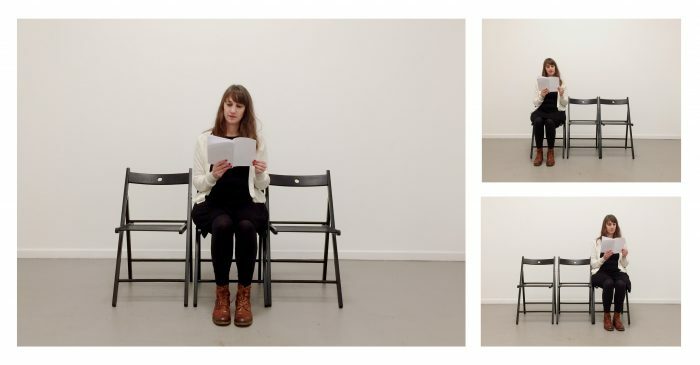 Epilogue has the form of a trialogue in which I change between three different roles, each one represented by a chair. When I am sitting on the chair in the middle I am in the role of myself, the chair to the left my late mother who passed away 2013, the chair to the right, my late father, who passed away 2017. The trialogue is constructed from fragments of conversations from my childhood home and goes backwards and forwards between different time periods; the time when both my parents were alive, the time after my mother’s death when my father lived alone and I often took the role of my mother, and the time after both my parents’ death and I continued the conversation alone, through memories, objects, diaries, and official archives. Throughout the performance, different backgrounds, experiences and roles are made visible, such as my my father’s alienation in Sweden, my mother’s belonging to the same country, and my own role somewhere in between. Most parts of Epilogue (when my parents speak to each other and when my father speaks to me) is performed in my parents’ own language, a unique blend of Swedish, English and Greek. A language that evolved during many years of being together linking their different mother tongues. With this performance I tried to revive this today extinct language and bring to light a way of speaking which can emerge in families of double origins. Instead of seeing my parents’ way of expressing themselves as a linguistic deficiency, I want to highlight the unifying, democratic and creative aspect in this way of using language. As a bridge between different belongings.